Recently six app developers from different parts of the world joined forces in an App Evaluation Program for Schools. The program will provide educators everywhere with free quality learning apps for the iPad platform. So far, more than 300 teachers from four continents have taken the opportunity to sign up. The program is really a win win. Teachers get to test great learning apps and we, the developers, get the opportunity to put our apps in front a very important group of our target audience. “The program is really a win win," says Patrick Larson of Happi Papi, one of the companies behind the program. ”Teachers get to test great learning apps and the developers get the opportunity to put our apps in front a very important group of their target audience. Although, giving feedback isn’t mandatory for teachers in the program, we have already gotten a lot of great suggestions back for our app Happi 123 which was sent out through the program last month," continues Patrick Larson. By joining forces in a program like this, the developers are recognizing the importance of creating alternative ways of reaching their audience. “The Apple App Store is getting more and more crowded every day," says Pierre Abel from L'Escapadou. ”It is very hard nowadays to get noticed on the App Store for all but the largest companies and the biggest mainstream app hits. 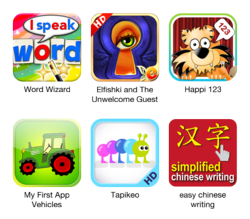 An evaluation program like the one we are part of here gives our spelling app Word Wizard an additional way to get exposure," adds Pierre Abel. Each app distributed through the program is followed up with a questionnaire about two weeks later. Having the possibility to post very specific questions about an app to a highly motivated group is worth a lot according to Jean-Eudes Lepelletier who has developed the app Tapikeo HD. The feedback will help the developers to further improve their apps. “If we ask the right questions, we can even get a clue as to what types of apps will be sought after in the future," explains Jean-Eudes Lepelletier. All developers in the evaluation program promotes the program on their respective websites and social media channels. “Working together to build the program is great in itself but the fact that we come from different countries makes it even better," says Pavel Mamaev of Elka Palka Production. The program, which started as an idea in a forum post on the Moms with Apps board for developers of family friendly apps, has now grown to almost 300 teachers. The founders never thought it would become this popular. “If we had," says Patrick Larson of Happi Papi, "we probably would have given it a cooler name than 'App Evaluation Program for Schools.' I wonder if we should change the name to 'The Happi Teacher Program,'” laughs Patrick. For further information, please contact Patrick Larson at (941) 928-1873 or info(at)happipapi(dot)com.